Protecting your hands with a pair of high-quality cold-resistant gloves is an important first step towards staying warm and comfortable when working outside, but there's more you can do to maximise your well-being. 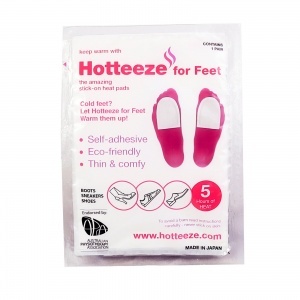 The Hotteeze for Feet Self-Adhesive Heat Pads are the ideal remedy for cold feet wherever you are. The self-adhesive heating pads easily and discreetly fit into most shoes, where they provide comforting heat for up to five hours. 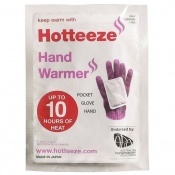 The Hotteeze for Feet Self-Adhesive Heat Pads are supplied in pairs. They are also available for purchase in a money-saving pack of 5 pairs. 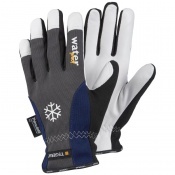 Working outdoors or in a cooler setting, such as a warehouse, cold room or storage, requires a pair of high-quality cold-resistant gloves that keep your hands warm and comfortable. Even though, however, you're active most of the time, it's still very important to keep your body warm as well, and the best way to do that is by making sure your feet remain dry and warm. The Hotteeze Heat Pads can easily be placed into most types of shoes, where they provide heat quickly and continue to work for five hours. Featuring a self-adhesive backing, the Hotteeze are convenient to apply to the underside of your socks without the use of adhesives or tapes. Ultra-thin and odourless, they are unobtrusive in use and provide warmth discreetly. A few minutes after application, Hotteeze for Feet will begin to produce heat at an average temperature of 37°C (102.2°F) and will continue to work for five hours. Please note that the Hotteeze Foot Heat Pads should never be applied to bare skin. Always read the instructions carefully before use.